"As Ben Franklin used to say, 'An apple a day keeps the doctor away.' To get a daily dose, I enjoy one of these beautiful breakfast bowls almost every morning. I sometimes garnish with diced persimmon and roasted almonds, but there's no need for honey or dried fruit - it's very satisfying without the added sugar." Place your knife about 1/4 inch from the stem of the apple and cut downwards. Place apple cut side-down and continue cutting straight down all around the core. Discard core and cut apple pieces into cubes. Transfer apple cubes to a bowl. 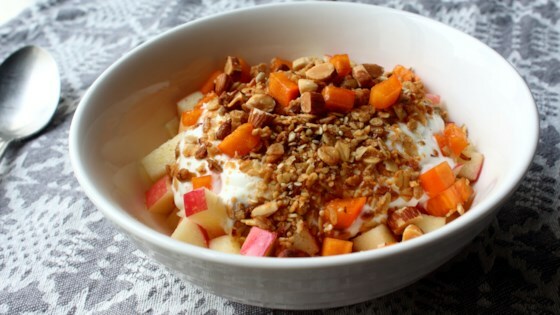 Spoon on yogurt and add granola. As far as specific ingredient choices go, I like to use chilled Honeycrisp or Fuji apples. Get the recipe for Chef John's Granola. I made this recipe and liked it. I will need to acquire a taste for the Bellwether Sheep Milk Yogurt. I definitely would recommend it to others. Glad I stumbled upon the recipe. I added a dusting of cinnamon to the yogurt but I love this breakfast idea so healthy and it really fills you up. I also experimented with different granola cereals for the topper.